Just an hour from Philly or New York City, there’s a seaside haven of rocking chairs on porches and a boardwalk bandstand, old-time penny candy and homemade ice cream, free parking, quiet streets, and more Victorian houses than the famed Cape May. It’s a magical place, transcendent, not unlike the setting of a really good beach book. Ocean Grove, New Jersey’s best-kept secret for more than 130 years, is quickly becoming the hippest getaway for urban professionals, artists, families, and those in search of refuge, rest, and renewal. I’m here now, writing this article on my own private balcony from the king-sized Room #5 of the Majestic Hotel. The Majestic has it all: a widow’s walk, an underground surf shop, a video library of movies for all tastes, and the on-site Oceania Restaurant where you can grab an Ostrich Burger for lunch. The Majestic is a castle, fit for any discriminating king or queen. Catering to the corporate market, there’s the requisite wireless access and the modern conveniences of the office with all the ambience and repose of the beach. My room is quiet, and my balcony is sublime. From here, right now, I can hear the ocean, and the strains of a group of kids singing “God Bless America.” A dog barks. A boy skims past on a skateboard. An August nighttime breeze blows, and for this moment I can forget about impending winter and tragic news in the world outside. It’s a Sunday evening in Ocean Grove, and a church bell chimes. Down at the Daily Grind, home of the best coffee in town, a husband-wife acoustic team called Raphael and Aly croons. Earlier today I saw a “praise band” religious service being held in a tent on the beach, just a few feet away from where a group of goth teens huddled in metal band shirts. Sporting black lipstick, thick eyeliner, and chains, the teens sneakily smoked cigarettes, probably hoping that their parents wouldn’t show up early from church. This is a diverse place, but it seems to have no divisions. I was watching an elderly woman – probably 90 years old and 90 pounds at her heaviest – as she watched the acoustic music at The Daily Grind. The lady had a cane, and she was bopping it to the beat. She was also lifting her feet and bringing them down as Raphael strummed his guitar. She was in sync with him, and I was digging her digging the music. All is cool in Ocean Grove, and Ocean Grove is cool for all. In the past two days, I’ve met a fabric designer, a harpist, a multi-pierced rock star, three teachers, a pro baseball player, two attorneys, a construction worker, a “magician” who used to work on Wall Street but now washes the sheets for a B&B, five writers, one painter, a maid who makes great quilts from men’s ties, and a few chefs. I’ve discovered that Bruce Springsteen’s publicity agent lives here, and so does a nice old aqua-haired lady named Alice, who does needlepoint and sings in her church choir. A Shangri-la of seagulls and a non-commercialized boardwalk, Ocean Grove boasts a dignified row of eateries and shops on the tree-lined Main Avenue. There are no tacky T-shirt joints in sight. No arcades. No water slides or rides. Visitors rent bicycles (the old-fashioned kind: no gears or handlebar brakes) at Ocean Grove Hardware, a wooden-floored establishment with antiques upstairs. The hungry have about ten restaurants from which to choose, including Nagle’s Apothecary Cafe with its collection of old pharmaceutical bottles. In the evenings, people line the sidewalk, waiting patiently for an ice cream cone from Nagle’s takeout window. Another great choice is Ott’s Restaurant, perched on the north end of Ocean Grove’s boardwalk, bordering the edges of Asbury Park. Ott’s menu is reasonably-priced and the food is outstanding, not to mention the view. Ocean Grove is the quintessential town that time forgot. A National Historic district, the community was founded by Dr. William Osborn, a Methodist minister. The location was just what the doctor ordered: a high beach, thick groves of pine, cedar, and hickory trees, and no mosquitoes. Natural boundaries were made by two lakes and the ocean, with gates across the remaining side. Until 1980, the town gates were closed with chains from midnight Saturday through midnight Sunday. No cars were allowed on the Sabbath. The nickname of the place was “Ocean Grave,” back in those days. Dr. Osborn and a group of other religious-minded folks joined together in 1869 to form the Ocean Grove Camp Meeting Association. The association continues to this day. The town is dry, with no alcohol served within the one-mile radius of Ocean Grove. Those with a thirst for alcohol or clubs, though, can make a two-minute drive and be in the hottest music scene around: Asbury Park, home of the famed Stone Pony. I’ve seen a couple of great bands there: Days Awake, Jody Joseph, Big Brother and the Holding Company. The Pony is a happening place, and there are always the rumors of Bruce or Bon Jovi stopping by for a surprise visit. It’s happened, just never when I’m there. I attended Asbury’s 31st annual Clearwater Festival. Continuing in the Pete Seeger tradition, Clearwater includes lots of environmental and political activism, plenty of kids’ activities, and a Circle of Song. There were lots of hippies young and old, rocking out to the Smithereens and the Maybe Pete band. Singer-songwriter Ken Shane played on the Family Stage, as did George Wirth. It was a great day, and now I’m back in Ocean Grove, as Asbury Park goes dark and people prepare for another week of work. The center of activity in Ocean Grove is the Great Auditorium, an impressive structure that’s almost football-field size. Featuring speakers and statesmen, opera stars and orchestras, as well as old folkies such as Peter, Paul, and Mary, the Auditorium has been visited by Presidents and personalities from Ulysses S. Grant to Guy Lombardo. Boasting a huge pipe organ, the Great Auditorium offers free organ concerts on summer Wednesdays and Saturdays. Nestled around the Auditorium are 114 tent structures, with fireproof canvas in the front and cabin/cottages built onto the back. Many of those who own the tents are fourth and fifth generation families: relatives of the original Camp Meeting Methodists. Some say that there s a 30-year waiting period to buy a tent. The beach, named by USA Today as one of the best in the world, is clean and thong-free. The beach badge, at $7.00 per day, is well-worth the cost. A perfect example of a 19th century planned urban community, the town is laid out so that the buildings nearest the ocean were built farther back from the street. This created a funnel to capture the sea breezes and channel them westward. This clever plan also allowed most porches along the street to enjoy the ocean view. Savvy innkeepers have lined their porches and balconies with rocking chairs. Even a loud car radio seems out of place here, where most of the bed and breakfast establishments lock the doors at 11:00. Claiming the country s largest collection of Victoriana, Ocean Grove offers many lovingly-preserved guest houses and B&Bs. One of the best-known is the Manchester Inn. Reigning upon Ocean Pathway, the Manchester beckons visitors with its huge and welcoming front porch. Located just one block from the ocean, The Manchester’s magic begins with camel back sofas and a Steinway piano in the lobby/common room. Muraled hallways and a collection of antique hand mirrors greet those ascending to one of the many charming guest rooms. There s a Sunday jazz brunch at the Inn’s Secret Garden Restaurant, and murder mystery events throughout the year. Innkeepers Clark and Margaret Cate have brainstormed a litany of popular events that keep the rooms filled throughout the year. There’s a Civil War Re-Enactment Weekend in November and a Chocolate-Lovers party in February and my own Writing by the Seaside in the summertime. The Manchester also offers a Harpists Escape and Spiritual Renewal Weekends. In the southern part of Ocean Grove is the Sea Spray Inn. The epitome of elegance, the Sea Spray faces both Fletcher Lake and the ocean, giving each and every guest a magnificent panoramic view hard to find anywhere else on the East Coast. There’s a garden that provides flowers for the rooms and herbs for the kitchen, as well as a porch and a second floor wrap-around deck. The formal dining room is used for breakfast, and guests often stray to the porch swing for morning coffee. The house offers all the modern conveniences, such as wireless internet connections and big-screen TV in the living room, but also available are old-fashioned entertainment such as Backgammon and Scrabble. Innkeepers Nancy and Tom Garson seem to have thought of everything, including beach bags in the rooms, towels, chairs, and all the necessities for a trek to the sand. With a choice of 6 guest rooms, I stayed in the Venetian room, charming with its red and gold theme and elaborate wall fresco. Considered by many to be the most romantic room in the Inn, the Venetian room boats a huge bathroom with a shower built for two. There is also the Asian-themed Birdcage Room, The twin-bedded Rosebud Room, the quaint blue and white Toile Room, the British Colonial Paisley Room with a gentleman’s flair, and the lovely Lavender Room. Located beneath the Sea Spray Inn is Sea Spray Snacks, an informal and easy option for beach-goers. A great choice for families with toddlers or teens in tow is the Albatross Hotel, directly across the grass of Ocean Pathway from The Manchester. Owners Bill and Marcie Reiley are parents of a big brood, and cheerfully welcome tousling two-year-olds as well as sulking teens. “This is what life is all about!” says the perpetually unruffled Marcie. 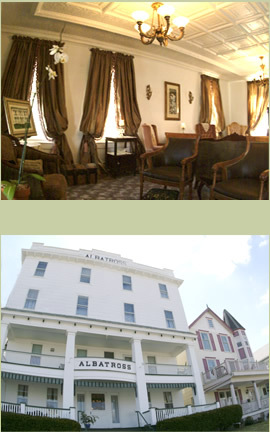 The Albatross offers a clean and cozy stay, with delicious continental breakfast. “I love the cranberry/apple muffins,” raved one young guest as her sister munched on a bowl of Fruity Pebbles. For families in search of an informal and comfortable hotel, the Ocean Vista is another fine choice. One of the few boardwalk properties, the Ocean Vista offers the mandatory porch with rockers, a continental breakfast and morning coffee, and affordable prices. That’s important. The house dog Pelle recently passed away, and so his beloved Frisbee, collar, and leash form a poignant altar in the lobby. Guests have been breaking down in tears upon finding that sweet old Pelle has died. And so is Ocean Grove.